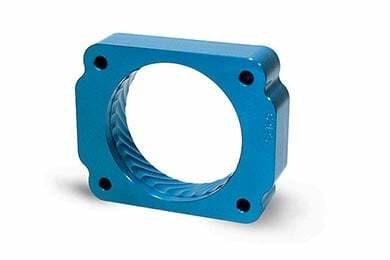 Jet 62130 - Jet Power-Flow TBI Spacer - FREE SHIPPING! Easy to install, looks good. Throttle response is much better. Just installed the Jet Flow spacer along with a K N Air System and it is a bit soon to evaluate these parts with the exception that my F-150 has greater accelleration.It seems to run more effortlessly as well. I am opptomistic that performance and gas milage will be increased as well. great product it does work with the cold air, but it does make a wistle unlike what they say but the sound is cool you can realy hear the air being sucked in. only complaint is needs better instructions but still an easy install. Nice piece but instructions need inproving. Horsepower inprovements unknown but did pick up about 1-2 MPG. Already having a K&N cold air intake, instruction were out to lunch...just have to know where its supposed to go and used factory bolts..not ones supplied in the kit. It was very easy to install. The stock air box was already off and replaced with an air raid system. Instuctions were ok but could have used more details and options. I have noticed a consitant, noticable improvement in mileage. Mostly over the highway though. Slight improvement on in town driving. Get up and go about the same, maybe just a little better. Overall I would put one in my next vehicle also. The installation was very easy. I have not seen a significant improvement in fuel economy but the throttle response has improved. low to mid range power is a lot better. Not really sure about gas milage. Just put the Power Flo spacer on my 06' Ford F150. Installation was a snap once I figured out which way was "up"; hint, each side must mate to a gasket. Nothing in the instructions to indicate that, and, to me, upside down looked right. As far as performance, uh, er, it's slight. A bit more response on the low end, nothing gained in the middle (wher e the Ford's really need it) and a bit more at the very top end. AND, IT DOES WHISTLE, contray to the mfg's claims (they lied), and the whistle became more pronounced when I added a K&N filter in the stock box. The whistle is apparent at low moderate acceleration, where you are most of the time, bummer. Suprisingly, after I added the filter, The "air drone", the roar you hear upon hard acceleration, was not as loud... At half the price I woud recomend, but you gotta like the whistle or don't buy. Save your money and put it twords a good exhaust system. The Jet Power-Flow was easy top install and fit perfect. I am running a Flow Master dual exhaust, Super Chips programmer and K&amp;N cold air system on the truck. I have yet to track the gas mileage, but I certainly can tell a difference in the mid-range of the powerband; it pulls strong from around 2000 rpm and up. Have not noticed any improvment in fuel or performance, but it does not make any noise. simple easy to install, better throttle response. I did need to use RTV gasket sealer at the o-ring. Did not seal properly. After that no problem. As always auto anything makes the purchase so easy. I have purchased several items prior from them and I am looking at headers and the gibson exhaust next. Then a programmer. Reference # 752-615-252 © 2000-2019 AutoAnything, Inc.